Sienna speaks | one toller. her human. the world. 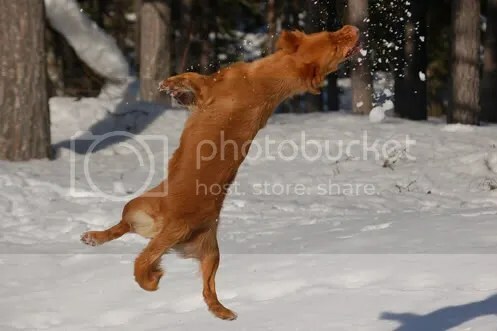 one toller. her human. the world. on may 22nd, lotta, my human and i went to the city where my human used to live before she moved to the city where we live now. we went there because my human had entered me for my first ever “official” dog show – we had taken part in “unofficial” aka training dog shows before, and since the judges in those dog shows had said they thought i was (AM!!!) beautiful , we figured we’d try a REAL dog show as well. lotta was to be my handler at the dog show, because she’s a PRO, and my human is a klutz! lotta told my human that she wasn’t allowed to stand so close to the show ring (why is it called a RING when it’s a SQUARE??? ), because lotta thought i’d become far too excited when i saw her, and i wouldn’t be able to “behave” in the show ring. so my human was left wandering aimlessly through the venue where the dog show was held while lotta and i strutted our stuff before the judge. my human stood at a distance at talked to an acquaintance while lotta and i were in the ring, but she couldn’t help but sneaking peeks at us from time to time. then the ring secretary raised the *pink* paddle too, and that meant you’d also been awarded a “ck” – which is short for “champion quality”! of course that was what i’ve thought of you from the very first time i saw you, because you *are* the most beautiful toller girl EVER, sienna, but it *was* NICE (understatement of the year!) to know that an “official” judge agreed with me on this! after the ck paddle had been raised i really wasn’t expecting anything else to happen for you, because you had tough competition from several other – older – toller girls. i continued talking to my acquaintance, and out of the corner of my eye i see lotta becoming VERY happy, grinning like mad, while she waved something blue and yellow. it took several seconds for it to register with me, and my initial thought was “??? that can’t be, can it?? ?” but it WAS – *you* had won the “certificate” (a fourlegger needs three “certificates” to become swedish show champion, so now you “only” need *two* more! ), and the “madness” didn’t end there, because *then* lotta started waving something red and yellow, which turned out to be the bob (best of breed) ribbon! 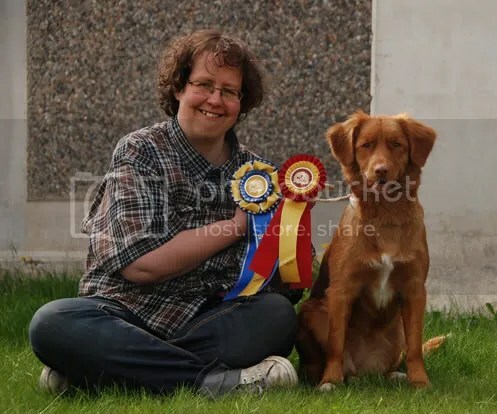 the judge saw what *i* see, and he thought *you* were the most beautiful of the ten tollers that were at the dog show!!! imagine that: that little “junior” toller (the name of the show “class” i entered you in – because of your age – is “junior class”. the next dog show you will be in the “young dog class”, because by then you’ll over 15 months old) beat them all!!! after lotta had told siw how you did at the dog show, she handed the phone back to me, and i talked to siw. we shared the joy of your success, and it was amazing! i thanked her for entrusting me with you, and i said ‘i WORSHIP this dog, but you already KNOW that…’, and she said ‘yes”. 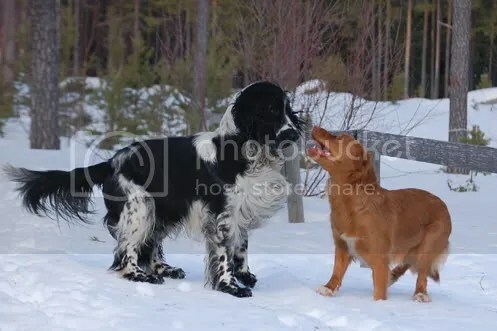 after that, siw told me that your mom matilda had also been awarded a “certificate” and the bob ribbon at her first “official” dog show, so you continue to walk in your mom’s paw prints! but it WAS nice to hear lotta say ‘i actually think she has the potential to become a show champion…’! so, that was my human telling you about my first time in the REAL show ring. what *i* have to say about that day? i was TOTALLY beat after having had to concentrate so hard for so long to behave, so i slept during the hour-long car ride home, and then i slept right through the evening and the night! today you’ve been a part of my life for a whole year. SO many memories are fighting to be the *first* memory to be acknowledged and shared now that it’s time to summarize our first year together – where to start? i’m still totally convinced that it was totte who lead me to you, sienna, and i *know* he was the one who told me your name. the day i got to bring you home was a WONDERFUL day! and after that came a few hectic weeks when you and i went with lotta and her beardie girls EVERYWHERE, and in between the field trips you and i struggled to find our routine when it comes to everything: visits to the little girls’ room, food, playtime and cuddling. and at the same time i was busy mourning totte – the grief after losing him was like an open wound, and it HURT. the day i scattered totte’s ashes out in the sea near lotta’s parents’ summer house (where he LOVED to play) was incredibly hard, but you were with me, little girl, and we were surrounded by people who knew and know how much i LOVED and LOVE totte, and what he meant to me. i put my hand in the water and touched his fur one last time, and then we went into shore again, where you were waiting for me – you couldn’t wait to share the next part of my life with me! you’re a WONDERFUL fourlegger, sienna! “if it’s not a toller, then it’s just a dog” – and they are SO right about that, sweetie! with your help i’ve become a VERY much more active person – who would have even DREAMED of guessing i (the world’s biggest couch / computer potato) would VOLONTARILY go for hour-long walks, and prepare half-mile long scent trails for you to find and follow??? scent tracking – your FAVO(U)RITE thing in the whole world, sienna! you’re SO good at that, little girl, and it’s VERY fascinating to see the change in you when we put the tracking harness and tracking line on you – the sienna who normally is so all-over-the-place and, well, HYPER, turns into this überfocused, thorough tracking virtuoso! soon you will make your debut in the show ring, and i’m starting to get nervous! *i* am not going to be your handler – we’re lucky enough to have “pro handler” lotta to help us with that – but STILL! 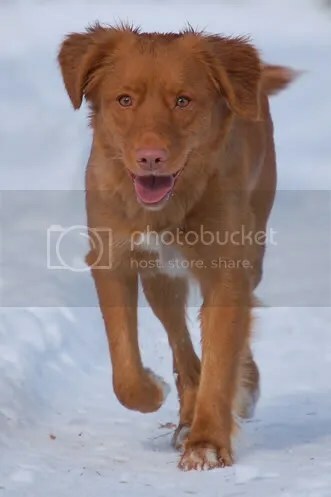 you ARE the most beautiful toller girl in the whole world, and i’m HOPING the judge isn’t BLIND to your beauty! to get to share your days is a GIFT, little girl, and i look forward to every day we have together! i’ve learned SO much from you, and each new day with you is making me a better person. i LOVE you, little girl, and every day i thank The Good for you. yep – for THREE WHOLE WEEKS my human and i were cut off from the outside world (well, ALMOST! ), and the tech heads over at our internet provider couldn’t figure out what was wrong, until yesterday, but now we’re BACK – did you miss us aka ME? the obedience class was LOADS of fun! well, apart from the part when this crazy drooling boxer MONSTER (possibly rabid? nah – my human says boxers DO that; drooling is part of the boxer “identity”, apparently: “boxer’s my name, and drooling’s my game”, kinda…) by the name of agnes tried to KILL me. i was having A LOT of fun playing with my human – our instructor aka my human’s best friend lotta told us to play with our human, to BOND with her or him. so i did – i got my human to wrestle with me, and push me and clap her hands for me and all that good stuff, and all of a sudden here comes the boxer express, the locomotive with a mission to KILL, agnes, CHARGING at us and ATTACKED me! lotta said afterwards that agnes must have fixated on me from across the training field. mah gawd – WHAT a circus! i was wearing my collar and leash, because i HAVE been known to make wild dashes around the training field when i get wired enough, and this way my human thought she’d at least have a chance of catching me by stomping on the leash. agnes was also wearing her collar and leash, and when she attacked me, i tried to get away from her by running around my human, and agnes followed me, and soon both of our leashes were securedly wrapped around my humans legs and feet. now, my human has bad knees – i think i have told you about how *she*, too, like me, has “loose knee joints”? 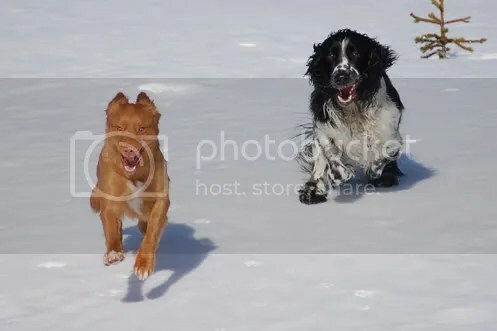 and so to avoid getting her knee joints dislocated, she THREW herself onto the ground, while agnes continued to chase me. my human checked me thoroughly afterwards, to make sure there was not any red on me that wasn’t supposed to be there, but thankfully i was alright. but agnes and i will never again be in the same training group. i think the least agnes’ minions (because they’re CERTAINLY not “responsible owners”) could have done was to apologize to me and my human. my human said she was VERY happy to see how much i have learned since last time we took this class! lets not talk about how i was the only fourlegger who did a lap of honour before going to their human during recall, okay? my human and i are looking forward to tonight VERY much – it’s the night when our “everyday obedience” class starts! yes, we attended that class last year too, but since we’re still working on some stuff that my human needs to learn before we can move on to “real” odedience training (aka COMPETETIVE obedience), we’re taking this class again. we’re VERY excited about seeing all of our “old” friends again! we’ve been working REALLY hard on getting me to be able to stay CALM and UNSTRESSED when i see twoleggers, and lemmetellyouthis: clicker training is a WONDERFUL training method! clicker training is a win-win thing for me and my human: SHE gets to feel GOOD about rewarding me at the exact moment i do something SPECTACULARILY awesome (which, if i may say so myself, happens OFTEN! *lol*), and *I* get TREATS! a while ago i did my human PROUD, and i got LOTS of treats for what i did. we were working on my ability to understand the “down” command, and then STAY down, without finding something better to do, or DIE OF BOREDOM while staying down. i was doing a FINE job of staying on the ground, and my human gave me loads of praise and treats, and everything was GOOD. then all of a sudden this man comes walking by us, and he MUST have known we we’re WORKING, because he could hear my human telling me to stay down, and then praising me for doing so. he KNOWS this, and YET he – in a VERY enticing and syrupy voice – whispers “well, aren’t YOU a GOOD doggie then!”, and i had to concentrate VERY, VERY, VERY hard to not want to get up and greet him, since he was whispering so sweetly to me. my human gave the man the Evil Eye, and then she told me to stay down, and then she praised me for doing so. so what does the (stupid) man do then? he does the same thing AGAIN. more praise for me, because by now i’d figured out that that man was NOT a *nice* man, but a TEASE who WANTED me to FAIL. my human gave the (STUPID) man the Evil Eye MUY GRANDE, and he finally walked off, smirking. eleven months today – eleven WONDERFUL months full of life, laughter, tears, toller madness and JOY. the past month we’ve been working VERY hard to have you learn not to be so stressed out when we meet people. clicker training ROCKS, and you’ve gotten REALLY good at ignoring passers-by, sienna! of course it’s still very hard for you sometimes, when we meet people you like A LOT, like the Treat lady, our neighbo(u)r janne and rigmor, but we continue with the training, and we WILL master this! at the beginning of this week we were at your twolegged grandma’s because i was going to the optician’s to get new glasses. as we were walking to your twolegged grandma’s house from the bus stop, we walked past a house where there were four deer standing in the backyard. you didn’t even SEE them, sweetie, but when a family of twoleggers (with a stroller) passed us, you became VERY happy, and wanted to go up to them and say hello! aren’t you supposed to be A LOT more interested in DEER than PEOPLE, sienna??? a couple of weeks ago you started shedding you coat, and since we’re going to that dog show in may, i became a bit worried. i talked to lotta, and she gave me a small bag of algae pills for you. now you seem to think of them as *treats*! your eating habits continue to confuse me (and everyone else): you happily eat algae pills, but turn up your nose at roast beef! i feel like we’re just waiting around for the snow to melt, so we can start with the scent tracking training – MEEEEEEEEEEEEEEEEEEEEEEEELT!!! i keep fighting to get the energy back that “things” have sucked out of me during the past six months or so, and you’re a GREAT help, little girl – you’re always in a good mood, and drag me out for walkies and training sessions. we’re trying to work on your retrieving skills, so you don’t forget how to do that! soon the “everyday obedience” class, and then we’re starting a tracking class at another canine club – YAY! 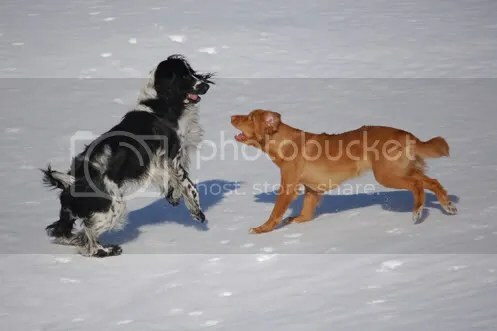 i hope we’ll get to see your boyfriend sigge and his human before we start the “everyday obedience” class, because sigge and you play SO well together! he’s one FINE looking boy, your man, sienna! 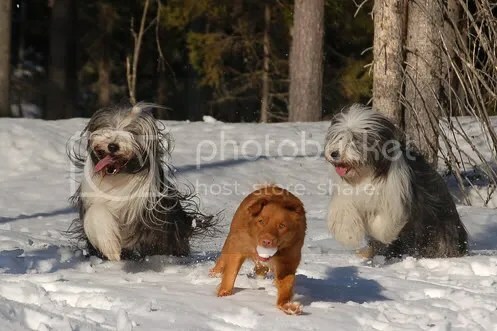 me or lotta throw snowballs for you to chase after and catch, and the beardie girls (who have almost NO interest whatsoever in retrieving games), race after you to herd you! you have my heart, and you have healed it. i LOVE you, little girl, and i’m looking forward to every new day i get to spend with you. i think i’ve told you that i was crazy about apples when i was a young pup? i still like apples, and i also like pears, and lingonberries, blueberries, gooseberries and raspberries (i’ve even learned to pick the berries myself! *grinning*). there’s really only been ONE type of fruit i couldn’t stand, and that’s BANANAS. yesterday morning my human was having breakfast, and she was having (among other things) a banana. she gave me a piece, and what happened next is so WEIRD (and frankly: VERY worrying): instead of taking the piece of banana and spitting it out unto the floor and looking at my human as if to say “WT*BEEEP!!! * – are you trying to KILL me, human?? 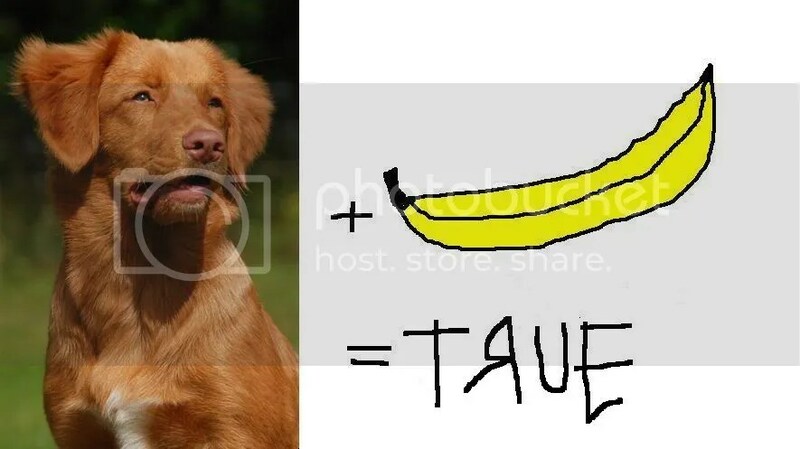 ?”, i ATE the piece of banana, and THEN i asked my human if i could have another piece, please? i guess this means i LIKE bananas now.